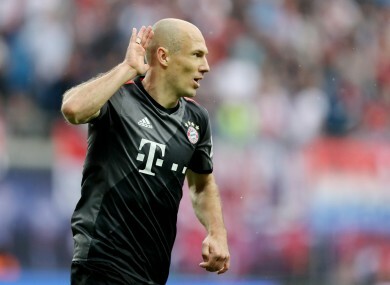 ARJEN ROBBEN HIT a superb solo goal in the 95th-minute to seal Bayern Munich’s dramatic 5-4 comeback win at RB Leipzig in the Bundesliga’s electric top-of-the-table clash on Saturday. Carlo Ancelotti’s star-studded Bayern, who were already confirmed German league champions for the fifth straight year, found themselves 4-3 down on 90 minutes until David Alaba drilled home a 91st-minute free-kick. 33-year-old Robben then proved he still had the legs to sprint clear of the defence as his winning goal capped a superb run. It was heartbreak for second-placed RB Leipzig, who were minutes from avenging their 3-0 defeat at Bayern’s Allianz Arena last December. Leipzig’s Timo Werner netted twice and with 21 league goals, he is the Bundesliga’s best German striker and a shoe-in when Germany’s squad for next month’s Confederations Cup is announced on Wednesday. Hosts Leipzig restored the lead when Xabi Alonso fouled RB’s playmaker Emil Forsberg and Werner netted home the spot kick. Danish striker Yussuf Poulsen made it 3-1 to Leipzig just after the break when his shot wrong-footed Bayern’s third-choice goalkeeper Tom Starke after clipping Alonso’s boot. But Bayern stayed in touch as Thiago Alcantara headed home Alonso’s cross on 60 minutes, before Werner grabbed his second on 65 after turning Germany defender Jerome Boateng. When Robben hit the crossbar with a free-kick on 84 minutes, Lewandowski reacted fastest to head home the rebound, which set the scene for the dramatic late goals. It means they are level on 61 points with fourth-placed Hoffenheim, who romped to a 5-3 victory at Werder Bremen with ex-Leicester City striker Andrej Kramaric scoring twice. Hertha Berlin and sixth-placed Freiburg, who drew 1-1 at Ingolstadt, are in pole position to qualify for the Europa League next season. Hertha are fifth after 19-year-old defender Jordan Torunarigha scored his first goal for the club after Salomon Kalou opened the scoring for the visitors with Darmstadt’s relegation already confirmed. Ingolstadt, 17th in the table, had their relegation confirmed after Hamburg’s 1-1 draw at home to Schalke means they are four points adrift with one game left. Email “Bayern score twice in stoppage time to prevail in dramatic 9-goal thriller”. Feedback on “Bayern score twice in stoppage time to prevail in dramatic 9-goal thriller”.